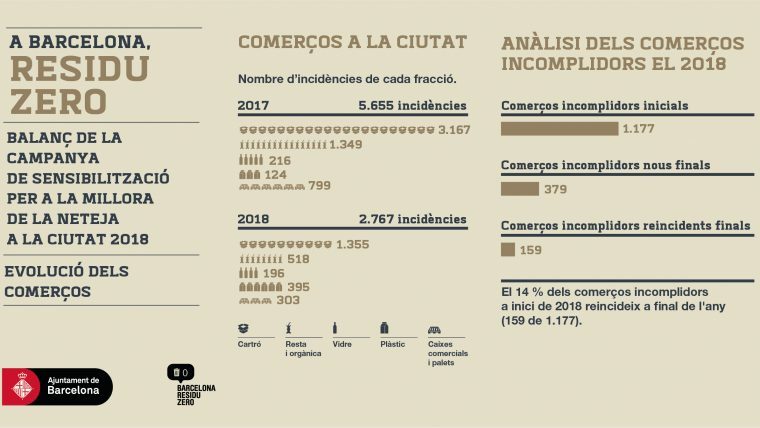 In the second year of the public awareness campaign to promote good cleaning and recycling practice, all indicators reflect improvements compared to the previous year. Over the course of the year, 256 critical points identified in the city have been monitored with eh goal of adapting services and find out what accounts for the lack of cleanliness in each case. 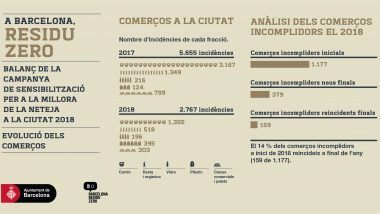 Compared to 2017, all the indicators studied in the awareness campaign show improvements in terms of people’s habits and those of commercial establishments. Over the course of 2018 a team of 20 environmental advisors visited 5,062 establishments and provided information for 33,784 people. 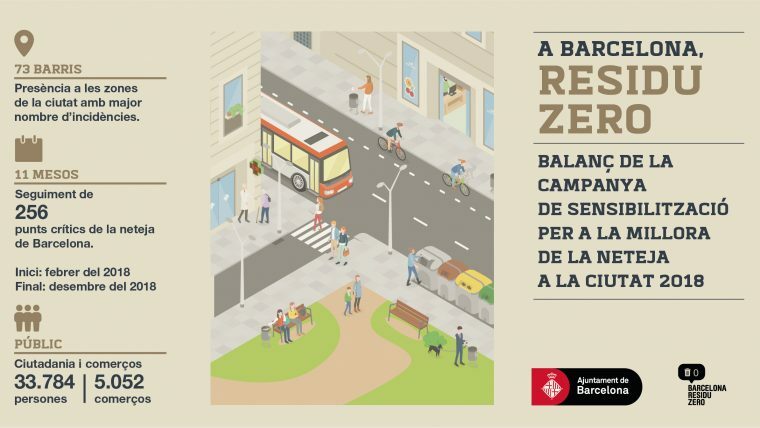 This on-street work enabled an analysis to be made of cleanliness in the city’s streets and squares, with daily monitoring carried out. 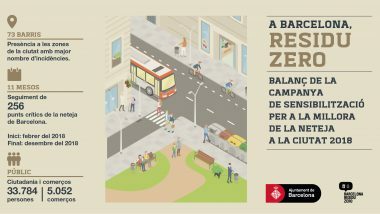 The campaign by Barcelona City Council focuses on two areas of work. Firstly, with daily monitoring of 256 critical points (identified by municipal services, district offices and local people) where cleanliness is a issue, with waste containers overfilled, old furniture dumped outside of collection hours and so forth. Secondly, specific action with residents, commerce and neighbourhood organisations to promote good practice in relation to dog ownership and hygiene, the use of recycling points, separation of organic material and free collection times for old furniture left in the street. 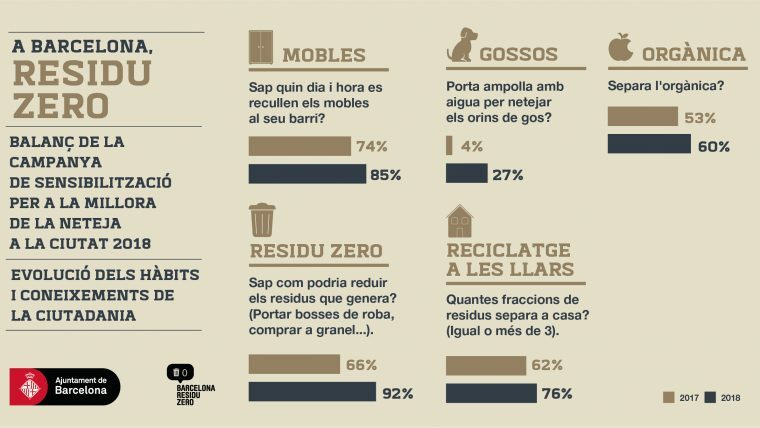 Notable good practice among citizens includes improvements in the collection and cleaning of dog urine by owners and greater knowledge about cutting the volume of waste and separating different types of rubbish. 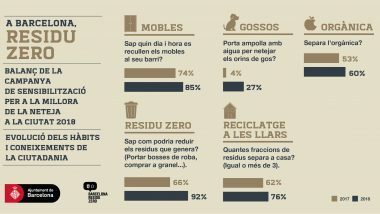 In terms of commerce, the number of establishments not managing waste properly has diminished by 86%, dropping from 1,177 to 159. The collection of paper and cardboard from shops has also improved by 35%. 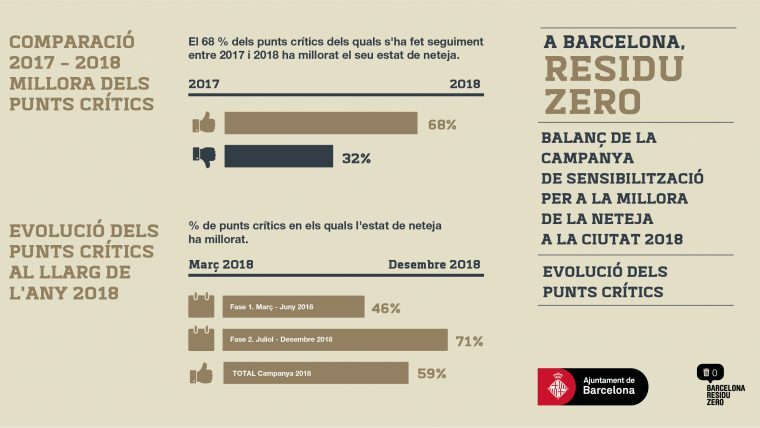 Cleanliness at the critical spots has improved by 68%, thanks to the participation and involvement of local residents and cleaning services adapting to the characteristics of these points. The awareness campaign will continue this year with the definition of areas with special needs, adapting cleaning services in each case.